I just took on the daunting task of putting together a Skaven Horde army. I put the construction of my massive Tomb Kings army on hold in order to start this army. 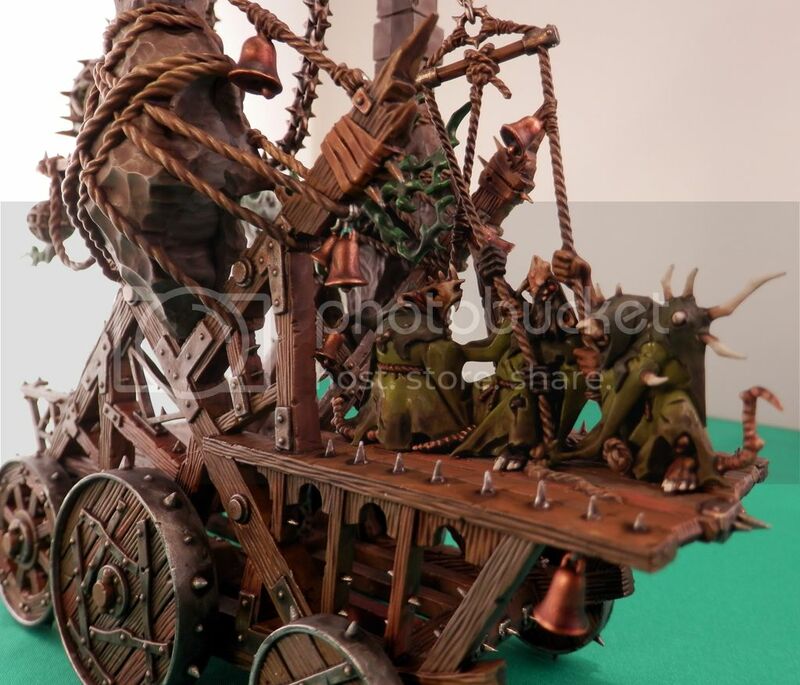 There will be roughly 300 models on the table during most 2500 point Skaven games. To paint the whole army my brush will hit 400+ models. I've already painted up a few models, and have a Display Board all planned out. Just have to finish assembling and painting. Once I hit the wall of over 225 Clan Rats/Slaves I will be going to my Display Board off and on to divert my insanity. 1. Where are the bases? 2. 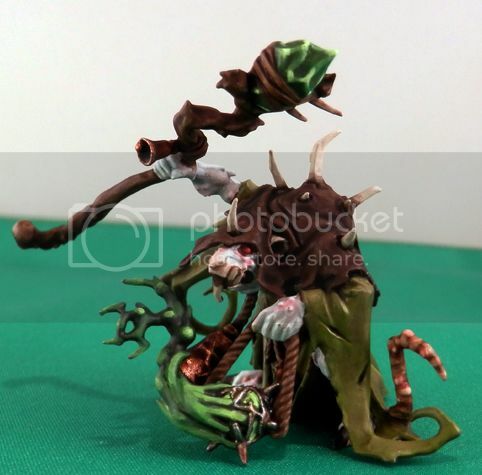 How did you paint the skin on the Plague Priest - I love it! Skin was surprisingly simple. He was primed Uniform Grey (P3). Just painted the fur a very light grey as a base. Did a darker grey wash on it to get into the cracks. Then highlighted with white. Then did a pink wash over his sores. Then highlighted the tops of the sores with white. I used a fleshtone on his nose and front of his mouth. Around his teeth you will see some brown there. That is because I directed some Devlan Mud in there and over his teeth before adding final highlights on his teeth. It added extra definition. I am working on the bases for those models. Big models I generally paint first then add the base. I paint the bottoms of those models just like I do every other part of it. OCD? The normal infantry models are already based, and I will paint those as I paint the model. The bases are corked. 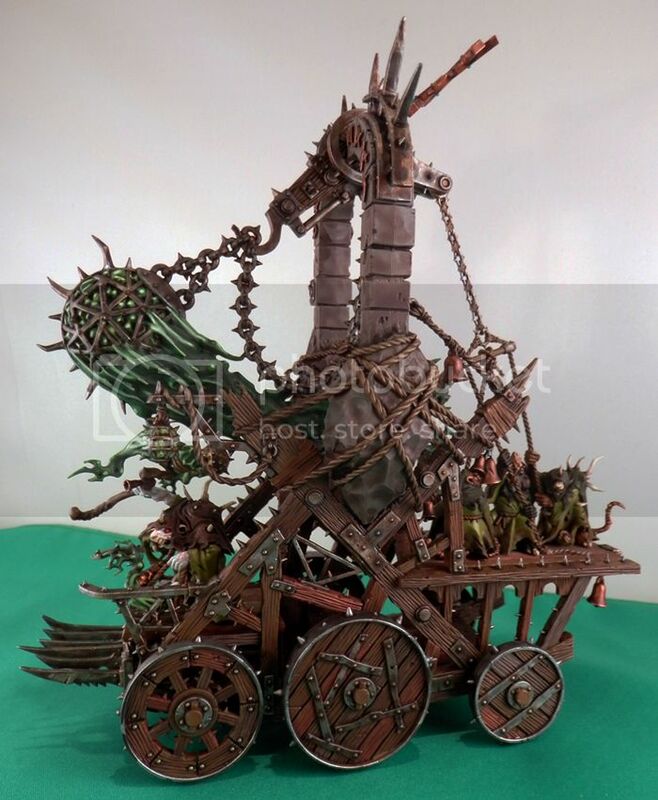 Keep in mind I am having to do over 400 bases, so I need something that is relatively quick, keeps to the plague theme, and will look interesting on a display board or green tabletop (which you will likely find is 75%+ of most generic tables). I am planning on making a Display Board, and am currently coordinating the color scheme. What I am planning on doing (so far) is having them traveling on a poisoned blackened land. So the cork on the bases will be primarily black with green and glowy poison seeping from the bottom. So in the cracks of the cork on the top, you will see some of the bright green poison seeping up from the bottom. On the sides of the cork, you will see from the bottom, a bright almost white green built up to a dark green as you get closer to the surface, then to black. 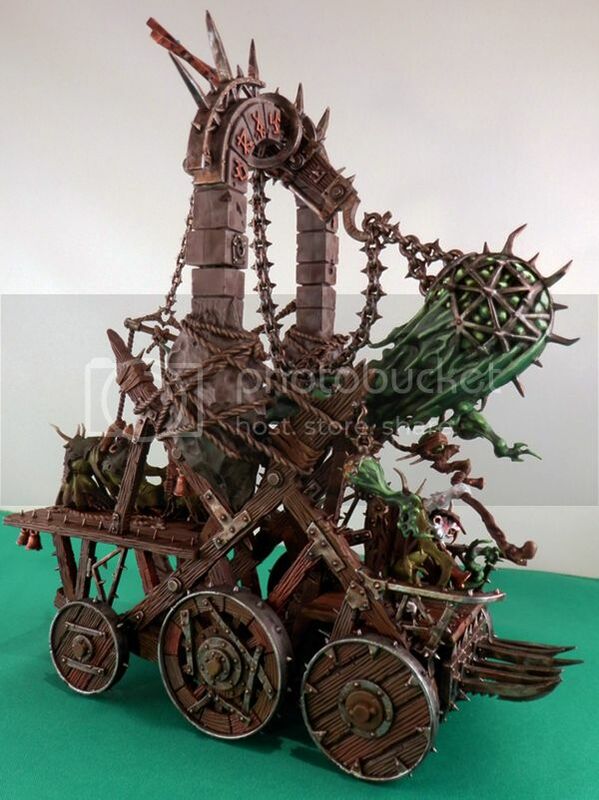 I think this will keep the focus on the paintjob of the model, keep to theme, and allow for an interesting display board, with rivers and pools of glowy green sludge pouring out of broken pipes buy a sewer entrance, and they all walking on and through it. I am hoping for simple, but interesting. I am thinking of framing the display board using painted pvc pipe instead of a picture frame or other wood. So the piping around the display board would be connected to the sewer pipes inside the board as it gets closer to the back portion of it, and would 'T' off into broken areas which are spilling the plagued water at various places. I have a whole list of other things that I have written down, but that could be for another post.